This time last year, the ridges, slopes, and forests surrounding Mount Hood looked a little bare. Marginal snowpack led to a dreadful winter sports season that never really got off the ground. This winter, by comparison, started early and shows no sign of slowing anytime soon. Snowpack levels are roughly 100 percent of normal, meaning outdoor aficionados have no shortage of options for enjoying the spoils of winter. But what if you'd like to skip the crowded ski slopes and explore the forests that surround Mount Hood? 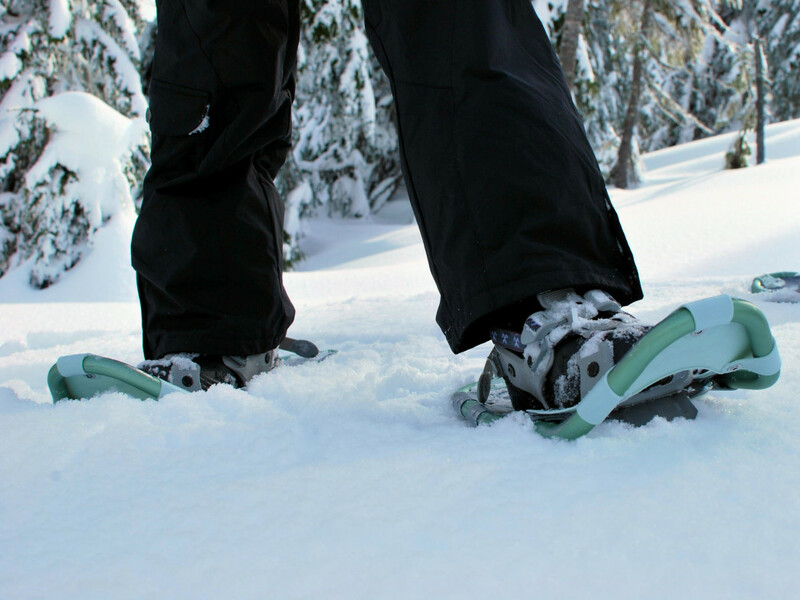 With serious snowpack and mild temperatures, there's never been a better time to try snowshoeing around Portland. If you're wondering where to go, what you need, or how to get started, we've got you covered with this simple checklist. First thing's first: You won't get very far without snowshoes. Looking to rent? Several local shops, including Next Adventure, all offer daily rentals in town. If you're picking up snowshoes on the way to Mount Hood, Otto's Ski Shop and Meadowlark Ski and Snowboard rent gear in Sandy. On the mountain itself, Mountain Tracks and Mt. Hood Adventure—both in Government Camp—rent snowshoe equipment, as well. If you'd rather buy snowshoes, expect to pay anywhere between about $80 and $200, though you might be able to find end-of-season deals around town or used gear on sites like Craigslist. Flat-terrain snowshoes, designed for flat hikes, have less traction and are best suited for occasional snowshoers; those tackling more advanced routes should look into beefier snowshoes, made from sturdier material designed to withstand tough terrain. You'll also want a pair of trekking or snowshoe poles (generally $40 and up) to ensure balance and ease your workload. You'll likely spend several hours on the trail, and slushiness is unavoidable, so make sure you're slipping a comfortable pair of waterproof boots into those snowshoes, as well. Beyond that, a pair of waterproof snow pants is a safe bet (a few stores around town have them on clearance racks this time of year, in case you're looking). It's also wise to dress in layers, which can help account for any temperature changes, precipitation, or other difficult conditions you may face along the way. Finally, sunscreen is a must, even on cloudy days, and you'd be well-served to throw a hat, sunglasses (or goggles on a windy day), and gloves into your pack before heading out. 2. Get ready for a serious workout. Walking on snow sounds easy enough, even with a pair of rugged, lightweight shoes designed to ease the trek. But snowshoeing can be physically demanding, even on flat terrain. The snowshoe's bulk forces some hikers to adopt a wider, longer gait than they're used to, and thick, packed snow can slow even the easiest outing. Hills that most hikers wouldn't notice at the height of summer can quickly become sources of frustration in the midst of winter. To that end, don't leave home without a full water bottle or two, as well as snacks to tide you over throughout the trip. Choose a trail that suits your abilities, and give yourself extra time to account for occasionally rigorous hills along the trail. 3. Choose from an abundance of options. So you've got your gear, and you're primed to get out there and start trekking. Now: Where to go? Mount Hood's proximity to Portland, varied terrain, rich forests, and abundant snowpack make it an ideal destination for would-be snowshoers. Fortunately, there are plenty of options for snowshoers of all skill levels on and around Oregon's highest peak. 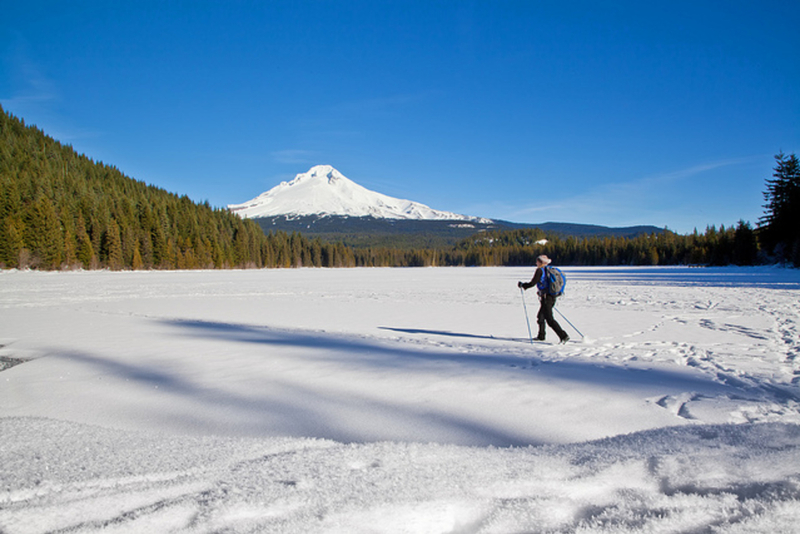 Trillium Lake is among the most popular snowshoe and cross-country skiing trails in the region, and for good reason: Absent a steep incline at the end of the loop, the beautiful, five-mile trail is perfect for beginners. The trail challenges snowshoers with moderate inclines here and there, but those who stick with it enjoy unbridled views of Mount Hood, jumping out from behind a frozen Trillium Lake, as well as dense forests, well-groomed trails, and a handful of flat stretches to keep newbies from swearing the sport off altogether. 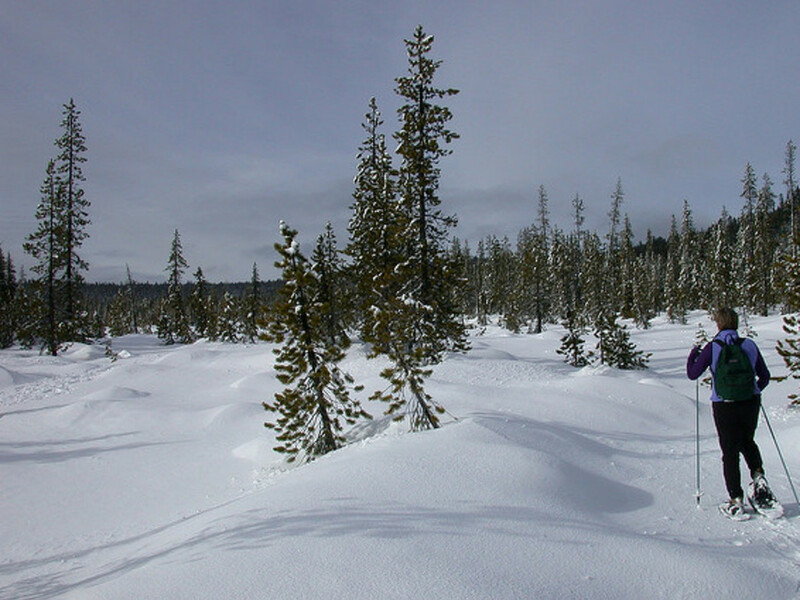 Much of the Barlow Pass route (which starts at Frog Lake Sno Park) is uphill, presenting a challenge for those unfamiliar with or unprepared for the rigors of snowshoeing. The trail might be better suited to experienced snowshoers, but it promises long stretches of solitude amid towering, snow-capped evergreen trees. Pro tip: Take some time to explore the path to Ghost Ridge, which offers views of Mount Hood, Mount Jefferson, and Trillium Lake from 4,800 feet. Snowshoers seeking out variety could do a lot worse than to check out the White River Sno Park. The trek offers numerous routes and off-shoots that afford explorers spectacular views of Mount Hood, the White River Canyon, and thick forests of snow-covered fir trees. The routes include easy options for beginners and longer, more arduous outings for advanced snowshoers seeking a little adventure. Looking for a winter adventure elsewhere in Oregon? 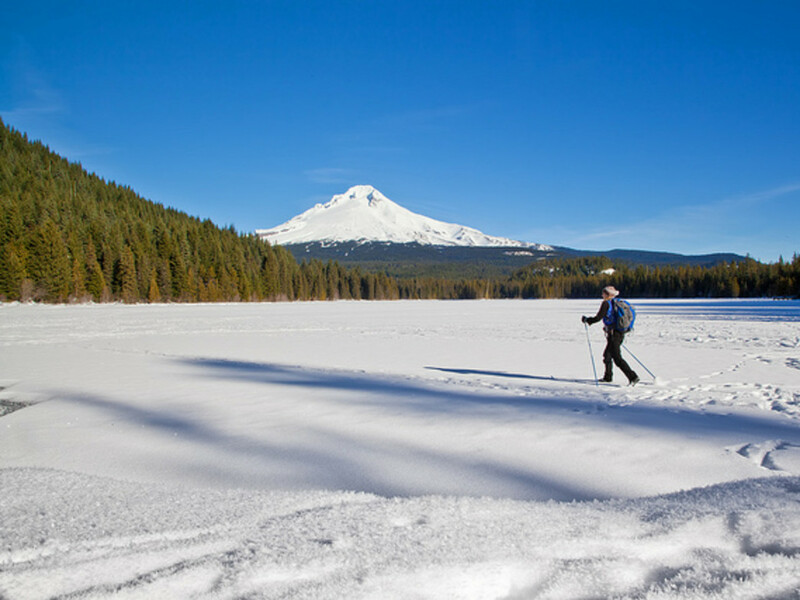 Mount Bachelor and the Newberry National Volcanic Monument in Central Oregon provide enough snowshoeing opportunities to keep you busy through spring, while the jewel of Southern Oregon—Crater Lake—offers several miles of trails. how many miles?